As Microsoft support for Windows XP draws to a close, many businesses, especially small businesses, are left with systems that are susceptible to hackers, malware and other security and operational hazards. For SymQuest client Broadreach Public Relations, the need to transition from Windows XP coincided with a realization that IT could be more of an asset. "I am not an IT specialist, and it got to the point where I couldn't piece it together anymore," said Broadreach president Linda Varrell. "For a small business, technology is the key to staying profitable and productive. If you are not embracing technology, you are behind the game." 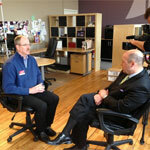 Watch SymQuest's interview with WMTWTV's Norm Karkos here. For small businesses, letting go of Windows XP will be a natural course of events. The hardware that supports it is aging. The software and the operating system no longer meet current demand. As Microsoft ends automatic security updates, Windows XP users should think about a transition sooner rather than later. The best strategy is to switch to Windows 7 or Windows 8 that still receive updates from Microsoft. Windows 8 may be the better choice, depending on your business’s specific circumstances, as its end-of-life isn’t until 2023. Before you buy a new Windows PC, you may want to see if your current PC is compatible. Microsoft’s Upgrade Assistant is a free download that scans your PC, desktop apps, and connected devices to see if they'll work with a later version of Windows, and then provides a free compatibility report. Depending on the version of Windows you're running, you can also use Upgrade Assistant to buy, download, and install Windows online. Create a Strategic Technology Plan to reduce exposure to security risks and obsolescence before you run into problems. Have a trusted IT advisor at your side if not on your staff.